Royal New South Wales Lancers History, Vernon. This section explores the evolution of the Regiment from its first origins as a Commonwealth formation. Each year maps the movement of men and often locations of the various Squadrons and Troops. 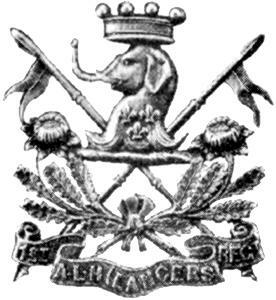 To get the flavour of the Regiment, it is best to begin the journey at 1890 and follow though each year till the end. The New South Wales Lancers Regiment, 21 January 1895. The following outline details the nature of the New South Wales Lancers Regiment from its inception on 21 January 1895 to the Federal re-organisation of July 1903. Each entry is referenced by the specific Gazettal entry, be it through the NSW Government Gazette or NSW General Orders. The information is extracted from Hanken, JK, Lineage and Officers of the New South Wales Military Forces 1854 - 1903, Sydney 2000, pp. 237-8. "F" Troop - Murrumbidgee River Light Horse. All members are to be Partially paid. Effective from 1 January 1890. NSW Government Gazette 116 p. 1783, 28 February 1890. Effective from 6 June 1890. NSW Government Gazette 302 p. 4491, 6 July 1890. Sydney Troop reconstructed as half troop supernumerary. Sydney half Troop now to be a full Troop. Effective from 12 February 1891. NSW Government Gazette 106 p. 1263, 12 February 1891. Effective from 2 June 1891. NSW Government Gazette 331 p. 4066, 2 June 1891. Disbanded effective from 3 January 1893. NSW Government Gazette 3 p. 43, 4 January 1893. The New South Wales Mounted Brigade was formed to consolidate New South Wales Mounted Regiment and New South Wales Regiment of Volunteer Cavalry and squadron organisation introduced. Effective from 18 July 1893. NSW Government Gazette 503 p. 5573, 18 July 1893. Singleton half squadron to complete establishment of No. 3 Squadron. Effective from 1st January 1894. NSW Government Gazette 694 p. 6681, 23 October 1893. Transferred from Senior Cadet Corps. Effective from 1 January 1894. General Order No. 4, 6 January 1894. March past at walk - "The Dragoon Guardsman"
March past at trot - "The Cavalier"
March past at gallop - "Bonnie Dundee"
The New South Wales Cavalry Regiment to be styled the New South Wales Lancers. Effective from 12 January 1895. NSW Government Gazette 49 p. 395, 18 January 1895. Civilian Rifle Clubs allotted to Regiments. First consolidated list as of 30th August 1895. General Order No. 17, 30 August 1895. Peace Establishment 1895 - 1896, 4 squadrons, 406 all ranks. NSW Government Gazette 579 p. 5542, 28 August 1895. War Establishment 1895 - 1894, 4 squadrons. 602 all ranks. NSW Government Gazette 579 p. 5563, 28 August 1895. Effective from 30 June 1896. NSW Government Gazette p. 4453, 30 June 1896. Effective from 1 July 1896. Peace Establishment 1900 approved, 6 squadrons, 638 all ranks. NSW Government Gazette p. 5298, 6 July 1900. General Order No. 113, 14 August 1900. Strength increased 1900 to 13 half Squadrons with the formation Newcastle Half Squadron of Lancers (Volunteers), totalling 50 all ranks. Effective from 22 August 1900. NSW Government Gazette 812 p. 6559, 22 August 1900. Peace Establishment 1903 Light Horse Regiments, 4 Squadrons 326 all ranks. Commonwealth of Australia Government Gazette 35, p. 387, 25 July 1903. No's. 1, 2, 3, and 6 Squadrons to form part 1st Australian Light Horse Regiment (NSW Lancers). No. 5 Squadron to form part 5th Australian Light Horse Regiment (NSW Mounted Rifles). Commonwealth of Australia Government Gazette 35, p. 396, 25 July 1903 491. Captain TF Knox, 1 January 1890, Honorary Major, 9 January 1896, Seconded as Aide de Camp to the General Officer Commanding, Major General GA French, CMG.